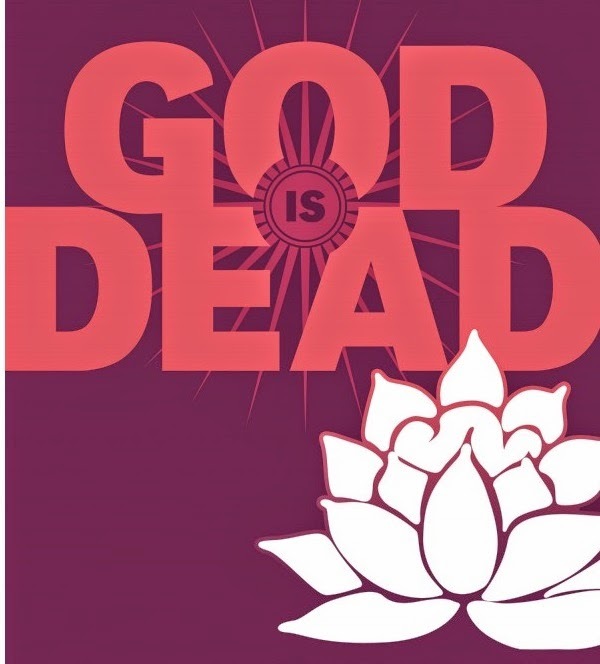 I've been reading the trade paperbacks of Avatar Press' "God is Dead". Dreamed-up by Jonathan Hickman and Mike Costa it has been quite fun. I checked out the first two issues when they were coming out serially but decided it felt like it would read better as TPBs. Since that point I have read the first and second trades, collecting the first six and then the the second half-dozen issues. I enjoyed them, although I actually think that the later issues read better, e.g. the issues that were written by just Mike Costa with minimal to no involvement by Jonathan Hickman, whose first six issues are pretty good, but lack as much of a clear focus as the later issues seem to maintain. For those wondering what "God is Dead" is about, basically all the Gods of every religion one day come to Earth and start fighting it out to determine who gets to be the boss of our planet. A group of scientists rebel against these Gods and eventually become Gods themselves through scientific means, with a single science-God prevailing. That's the first trade, and then the second one jumps forward a great deal of time later (a generation or two) to show the ramifications of all that happened and how some remaining Gods who have stayed hidden start fighting back with the assistance of mortals. It's pretty good stuff. Despite picking up the trades I wanted to get the "Alpha" and "Omega" issues that make up "God is Dead: the Book of Acts" on their own because I heard of the who's-who of talent that were working on them and figured I didn't want to have to wait forever to get to enjoy the comics. Therefore, I picked them up and was able to follow them quite well, if for no other reason than they mostly seem to take place earlier-on in the series' time-line. Was I wise to not wait and instead pick these issues up earlier? Yeah, I would say so overall, with one issue definitely being a treat and the other being at least decent. The comics are an anthology of sorts with their variety of comics, the story written by Mike Costa known as "Arts and Letters" serving as a bridge between the books, with its first and second parts taking place in "Alpha" and "Omega" respectively. It focuses on an ifrit (a sort of supernatural fire-jinn/genie) that is involved in the solving of a mystery of a murdered God that goes much deeper than it or its fellow Gods suspect. It is a pretty good story and answers some questions about just what caused all the mayhem the series has shown. It opens each book and serves as a good appetizer for the rest of the stories we get in each volume. Alan Moore, in the flesh (ink?)! I can say with no hesitation that I enjoyed the "Alpha" comic more than the "Omega" one thanks to its two stories (besides the just-mentioned opening one in each book) being dynamite yarns. The story "Grandeur & Monstrosity" is a delectable piece written by none other than Alan Moore himself and featuring...well, Alan Moore himself. 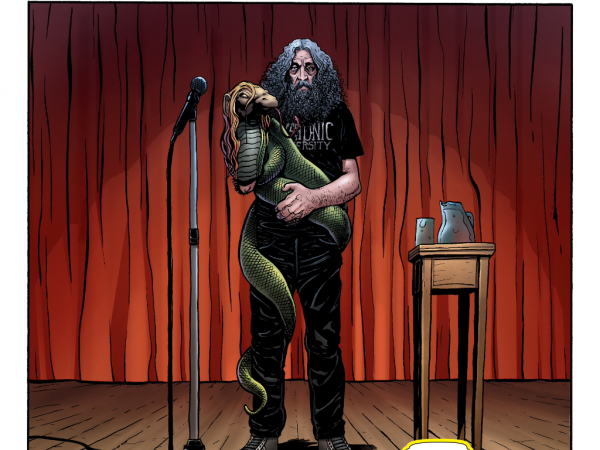 Yes, this is a bit of a meta-comic as it features someone who is clearly Alan Moore dealing with the fact of how with all the Gods coming back its odd the God he and only he worships, Glycon, has yet to appear. The thing is, however, that as Glycon was created as more of a performance piece and a self-declared hoax, it takes Moore presenting Glycon on a stage for the "God" as it were to come into existence. It is a fascinating story full of humor and enough self-awareness to be clever but not overly smug. The last story in the "Alpha" comic is titled "Pitter Patter" and is written by Si Spurrier. It focuses on a cherub bemoaning the fact that early on in history he and his fellow creatures were shown as terrifying things, but through the passage of time and various interpretations he has been reduced to being a cute little baby with wing. Sounding a bit like some of today's child-stars who want to convince everyone they are an adult now our cherub relates his sad tale over whiskey to a bartender about how no matter what attempts he makes people think of him as cute and adorable. The story is a fascinating treatise of sorts on religion and aspects of celebrity that can make life difficult for those who become pigeon-holed into a particular -role--be that acting in a film or acting as a piece of heavenly force. When I say how "Alpha" was clearly my favorite comic that isn't to say "Omega" was bad. Its stories just were not as great in my eyes. "Omega" has the conclusion of "Arts and Letters" and brings it to a satisfying close, then follows that with "Alastor: Hell's Executioner" afterwards. Written by Kieron Gillen, "Alastor" is about a demon who despite being an awful and terrible creature is also logical and sees how another demon's plan to invade Heaven is just terrible, resulting in Alastor taking violent action to prevent it. It's a perfectly fine story but considering how amazing some of the stuff Gillen has put out is ("Young Avengers" being a recent example) it is kind of sad to have him turn in a "perfectly fine story" when a reader knows he can provide much more than something passable. The last story in "Omega" is "The Great God Pan" and is by no means a bad entry, but a little annoying. Why is it annoying? 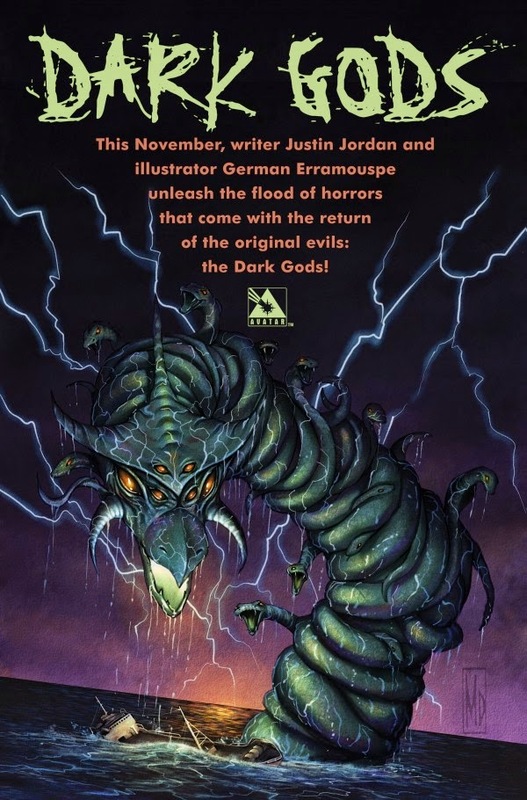 Well, it isn't really a complete story so much as an taste of writer Justin Jordan's newly upcoming series, "Dark Gods". Whether this tale takes place in the "God is Dead" universe or the "Dark Gods" world (or if both comics take place in each other's continuity) is unclear, but it is obvious this is meant to be a sampler/advertisement for Jordan's upcoming series--and that results in a story that is good, but as I said, annoying. Having your last story promote another comic is a bit annoying. These "Alpha" and "Omega" comics provide good stories and also serve to show how a variety of writers can put their own unique spin on tales set in the "God is Dead" Universe. While I may have been more fond of the "Alpha" comic I did also have fun reading "Omega", and would of course recommend getting both as they obviously are designed to go together. The amount of talent on display in these pages is staggering, and I really had a wonderful time reading Moore's and Spurrier's stories. Should you not even be familiar with the "God is Dead" comics you could still enjoy the "Alpha" and "Omega" comics with relative ease and I would heartily recommend doing such a thing. 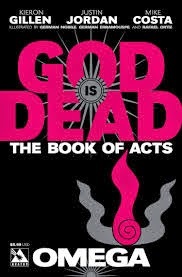 God is Dead, The Book of Acts: Alpha: 4.5 out of 5 stars. 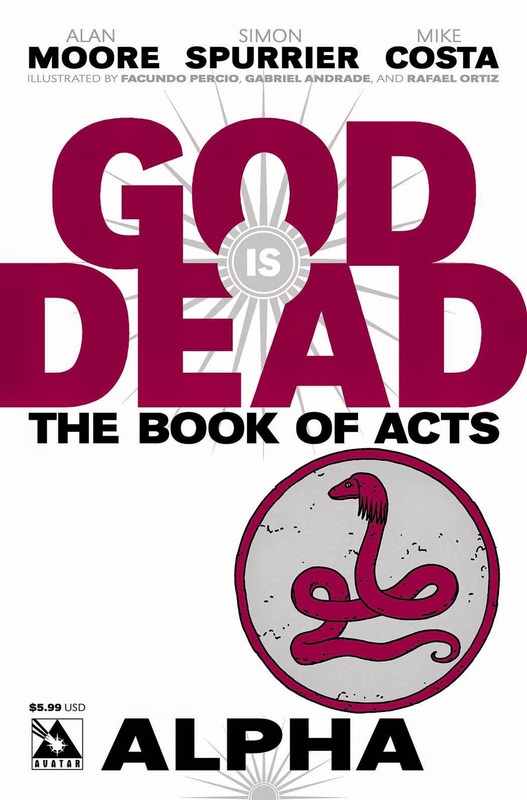 God is Dead, The Book of Acts: Omega: 3 out of 5 stars.